A view taken in strong spring sunlight on the last Saturday in March. Still snowing. 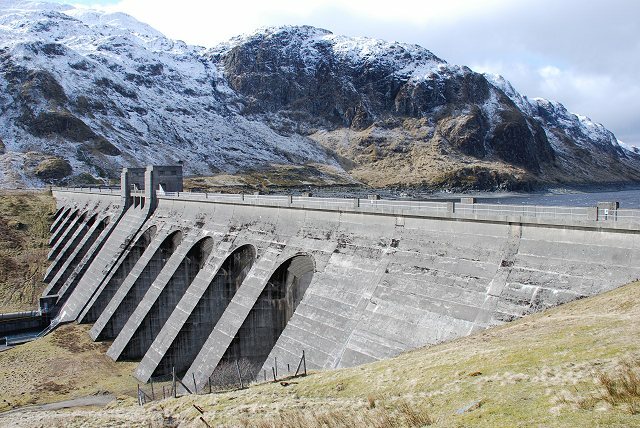 The Lawers section [of the Breadalbane scheme] collects water through a system of tunnels and aqueducts and diverts it into Lochanna-Lairige, the main storage area which lies in the pass between Loch Tay and Glen Lyon. The water is held back by Lawers Dam, a massive buttress-type dam 344 metres long and 42 metres high. Finlarig Power Station on the shores of Loch Tay uses this water by means of a pipeline and operates under a gross head of 415 metres, the highest currently available on any of Scottish Hydro Electric's schemes. © Copyright Patrick Mackie and licensed for reuse under this Creative Commons Licence.